We have a wide range of bathing aids to help with taking a bath or shower, from grab rails and bath boards to shower stools and powered bathlifters. The true recliner. 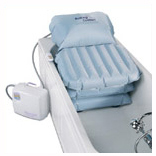 This inflatable bathlift makes taking a bath easy by gently lowering you to the bottom of the bath. When finished you re-inflate at the touch of a button to lift you steadily, level with the top of the bath. Easy to store, easily transportable and requires no fixing to existing bathroom. Fewer seams to protect fragile skin. The Bathmaster Deltis Bath Lift is a patient bathing device intended to assist a bather into and out of the bath. The Bathmaster Deltis is designed to make the pleasure of taking a bath safer and easier for both user and carer. The Bathmaster Deltis is a fully battery powered, self-contained bath seat which requires no plumbing or electrical installation and is suitable for use in either domestic or institutional situations. No drilling or permanent fixing is required. The bath lift folds compactly, and separates into two parts, enabling it to be carried, transported and stored easily. The Bathmaster Deltis is available in the standard unit with a user weight limit of 140kg (22st). 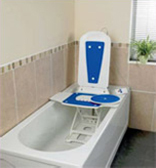 Image shows the Bathmaster Deltis with a swivel transfer seat which is an optional extra. A heavy duty Bathmaster Deltis is also available. Includes a fantastic 4 year warranty on the motor and the hand controller. 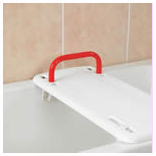 For ease of transfer this moulded bathboard is supplied with complete with handle. The width adjustable brackets have anti-slip rubber pads. 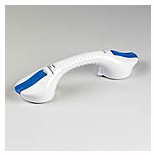 This suction grab rail offers a sturdy and safe support to the user without having to screw the product to the wall. It benefits from safety lock indicators.